The new update 6.05 of our Outlook-Helpdesk-Software “ReplyButler” has arrived. 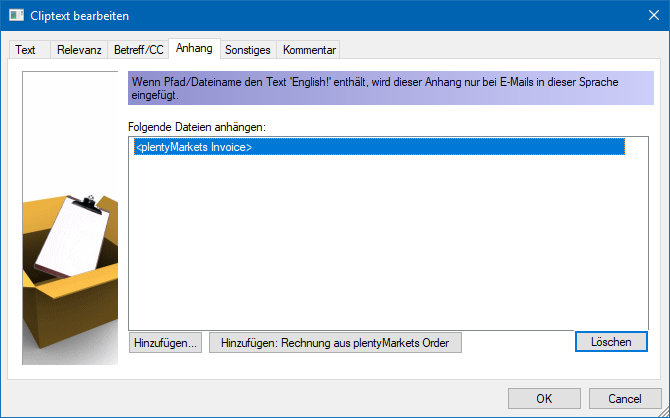 PlentyMarkets customers can now download the latest invoice of a customer fully automatically and attach them to an e-mail. This only needs to be activated for a text module. In addition, the links to the plentyMarkets admin interface have been improved. This entry was posted on Tuesday, October 2nd, 2018 at 1:59 pm	and is filed under Helpdesk, Microsoft Office, New Release, ReplyButler, Uncategorized. You can follow any responses to this entry through the RSS 2.0 feed. Both comments and pings are currently closed.